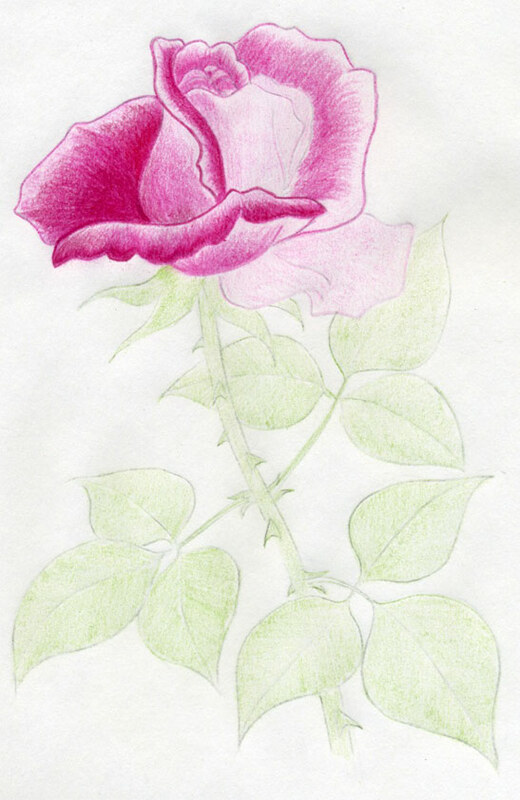 You can learn how to draw a rose in many different ways. On these rose drawings related pages I will show you how to make a nice drawing, both in graphite and color pencil. Consider these drawings as one of the possible ways to draw. Not as the only way. At first, roses may look more complex and complicated than any other flowers. But there’s no reason to be disappointed or scared. 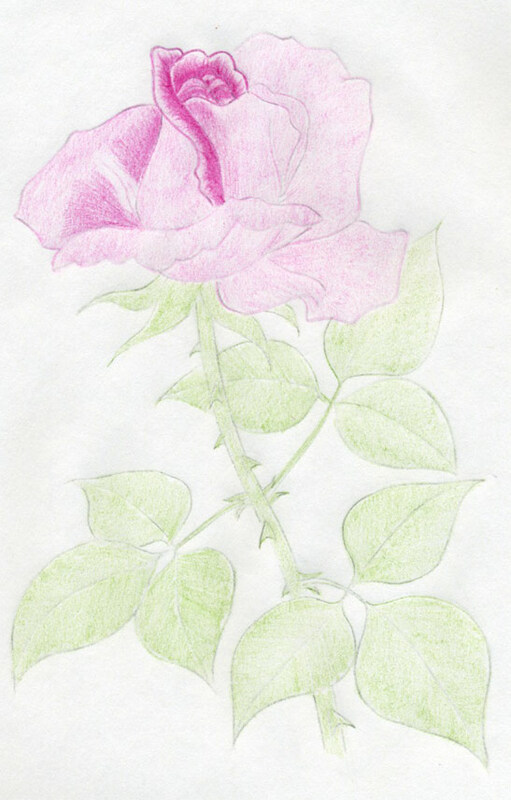 I promise you that after only a little practice you’ll be drawing beautiful roses you can be proud of. 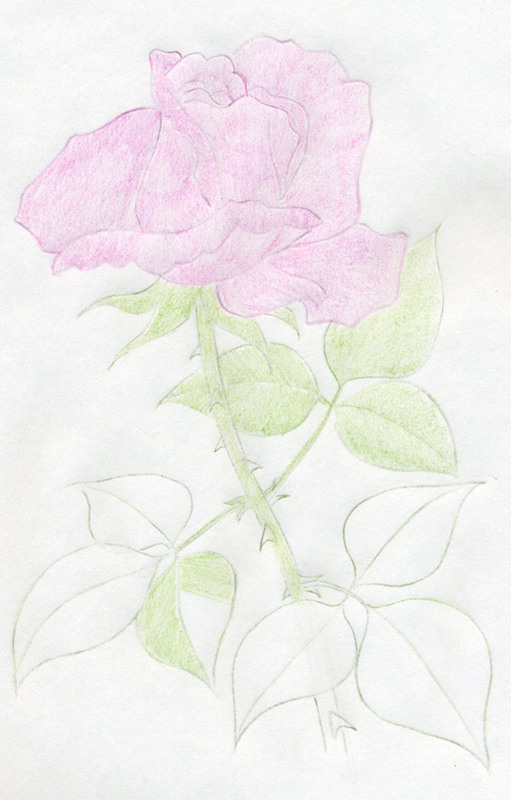 Your friends will ask you to teach them how to draw a rose, you’ll see. 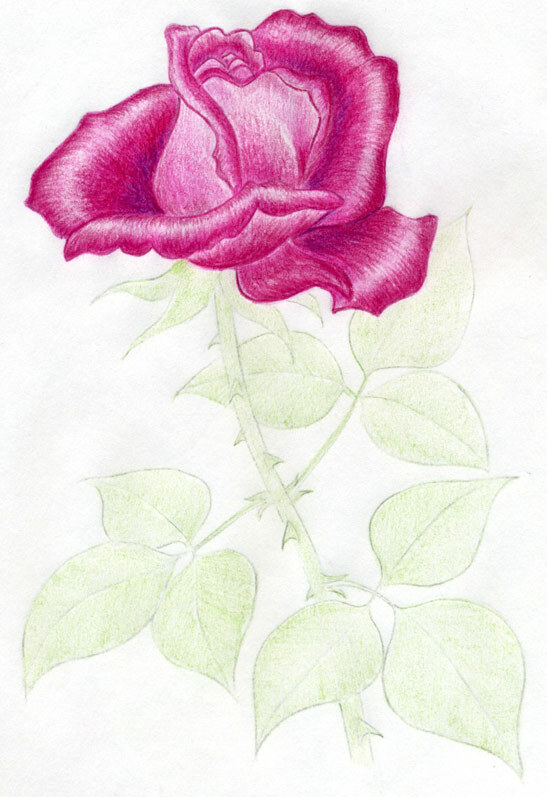 Many people are giving up drawing a rose because it just looks “too complicated” and they don’t know where to start. My guess is that they never really even tried to draw one. You will feel much better when you try. Trust me I was there too. Most of our fears disappear when we do what we fear most. This rose drawing exercise is focused to begin from the center of the flower and gradually evolve outward. 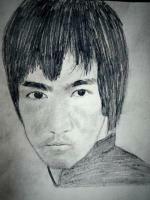 It is only one of the possible ways to draw. The flip side of this approach is that it is a bit difficult to predict exactly the final size of the whole rose. 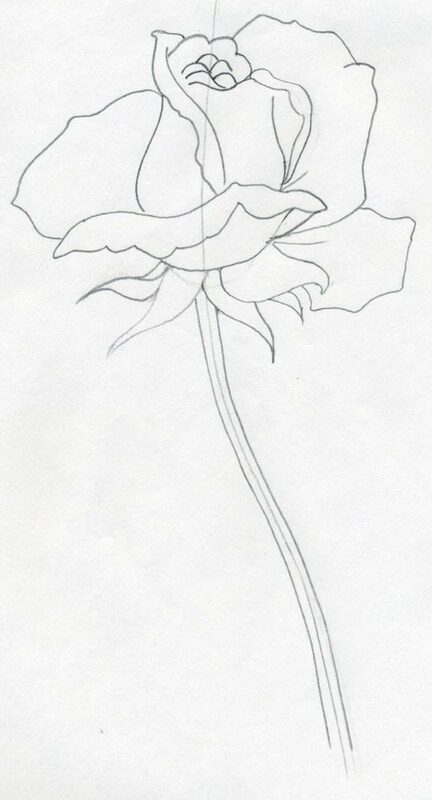 This is a simplified way of drawing such complex flower like a rose. Draw a couple a wavy shapes. These wavy lines represent the tips of the central petals sticking out in the middle. 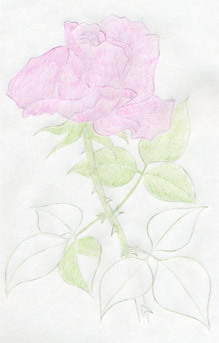 In the beginning it resembles to a cartoon illustration rather than to a rose drawing. 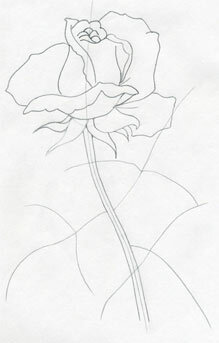 Analogically you can learn how to draw a rose from outside in – of course, but you would have to draw more accurate curves and contours in order to match the central point when you reach there. 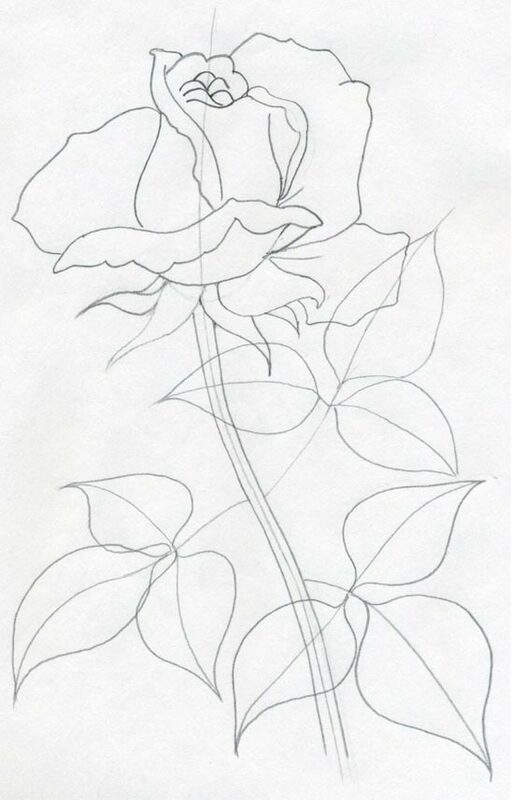 Continue to draw – add – petals. 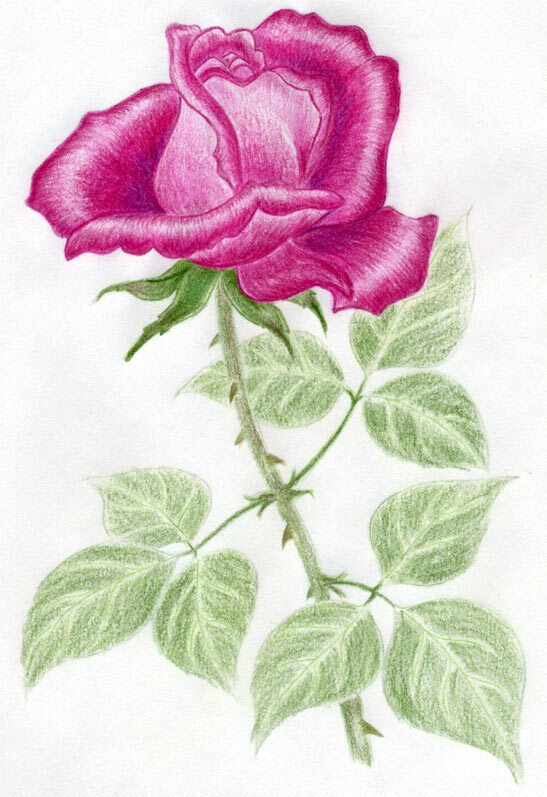 Notice that almost every rose has its petals curled outward on the edges. 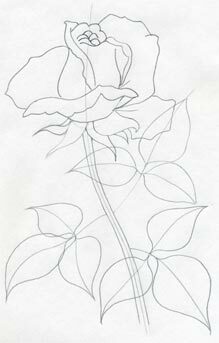 Draw only the outline contours of petals. 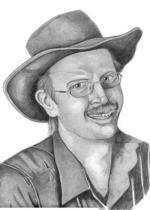 You need not to draw them absolutely perfectly and exactly; you are a human not a scanner. Shape of the rose’s head is gradually emerging. 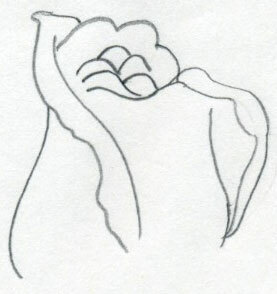 Draw the last petal on the bottom and add three visible sepals. 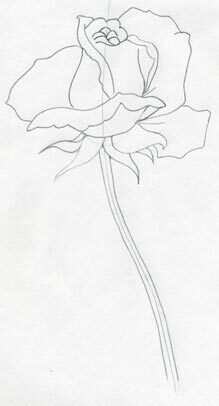 Then by single pencil line outline the stem. This line is the guideline around which you draw two parallel lines. See the picture. You choose how long or how curved will be the stem. I made it like this but you can make yours as you like. 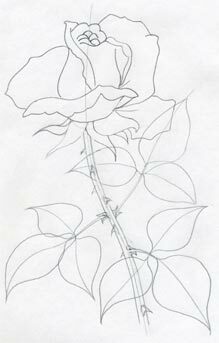 Outline the petioles and leaf lines as you see on the picture. 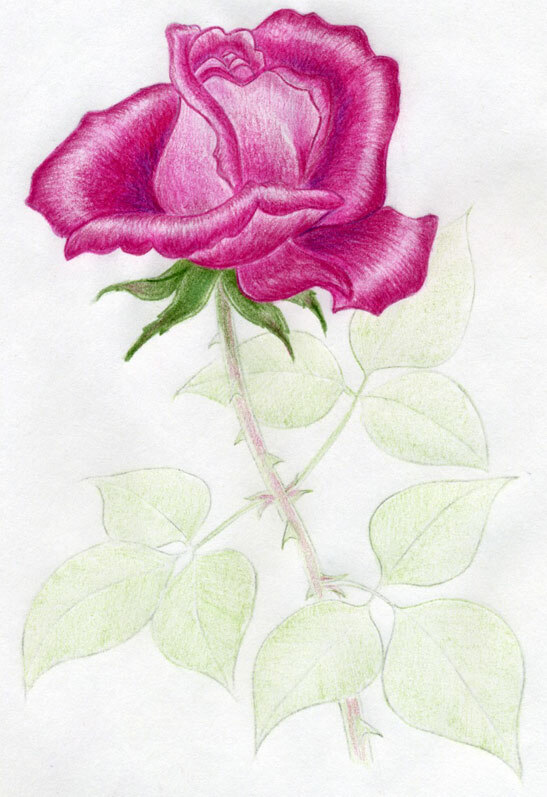 Using this simple technique you’ll learn how to draw a rose that will look as realistic as possible. 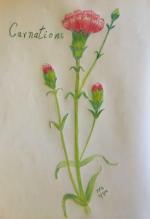 You can notice that on every flower stem there are several petioles with leaves. 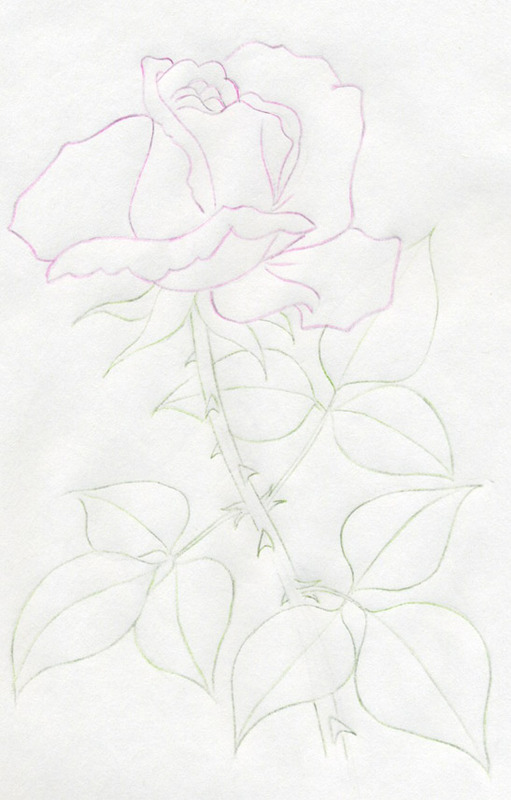 The shape of rose’s leaves is very simple and very easy to draw. Notice that every leaf has visible veins. You can outline the side veins as you like but the central vein is always running along the leaf. When you are learning how to draw a rose, do not forget to add a few thorns. The process of coloring the rose is virtually the same like Hibiscus or Tulip Flowers or any other flower. You need two color pencils: pink and light green. 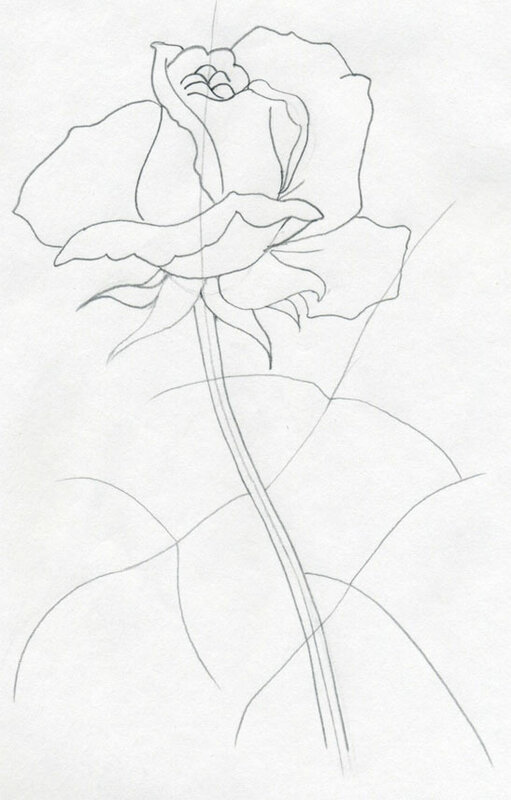 Over the graphite pencil lines, outline the contours of the rose. This time make sure the lines are exact. Head of the rose is pink and the rest is light green. When you are done, erase the rest of initial graphite pencil lines. 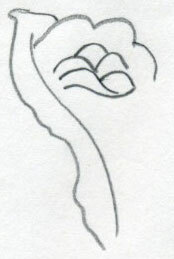 The only colored pencil lines remain – similar like on this picture. 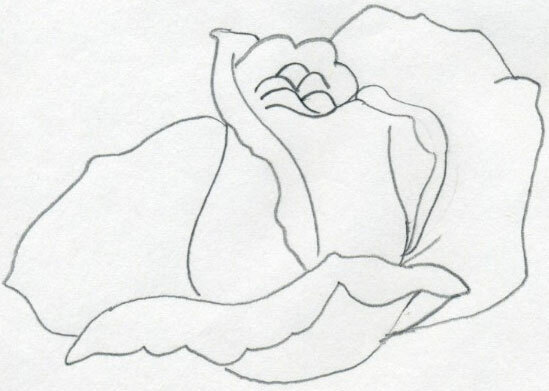 Now you have a perfect “how to draw a rose template”. Begin to color the head in pink and the leaves in light green. No shading, no pushing the color pencil at this stage. Just gentle and even basic coloring as you see on the picture. First, start to shade the rose from the head. 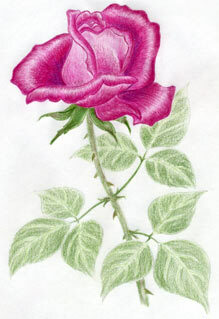 Use the same pink color pencil and create shade by stronger pencil strokes. Be careful, always move your pencil strokes the same direction as the petals are growing. Observe these pictures, you’ll get the idea. The pencil strokes are better visible here. They should always follow the direction of petal growing. 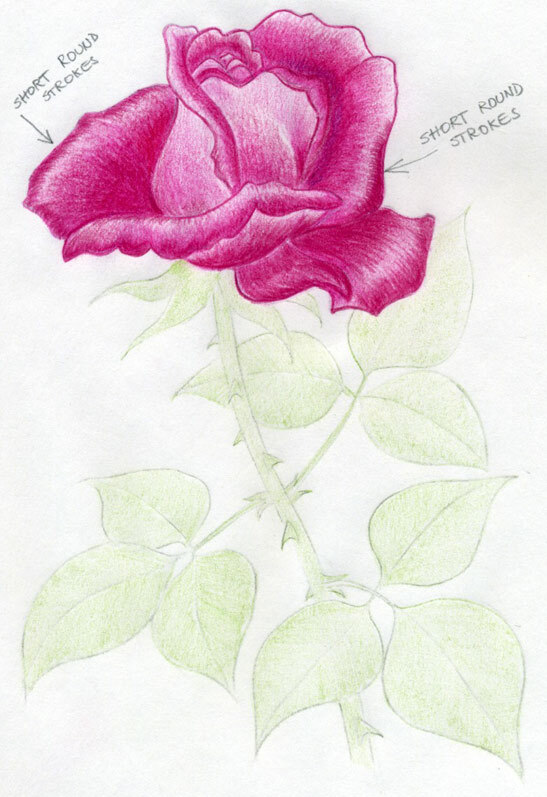 Always remember this important point when you learn how to draw a rose. 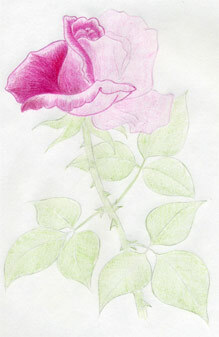 Gradually create shade and the rose head is getting nicer. Always try to make it better than mine! One more detail. Let’s give this rose even better look. Refine the shade by short round strokes only on the edges of the petals. If you have kneaded eraser you can create the lighter part on the edges. Kneaded eraser is good because you can remove the color simply by touching that part on the rose by eraser. When practicing how to draw a rose, you may discover your own new ways of adding up final touches. 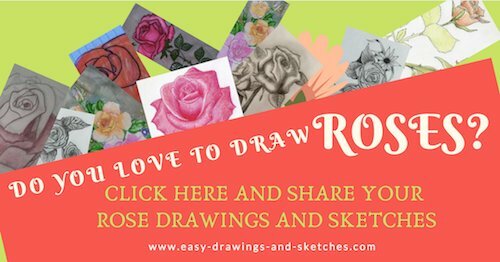 This will give your rose drawing a personal print. Now you know how to do both. 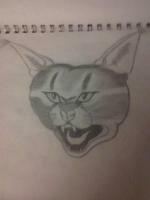 Make your drawings always better than mine! Get your dark green color pencil and continue to color the rest. Start with the sepals first. Darken the flower stem and the leaves. Add a gentle touch of dark red color along the stem before you darken it with green color. 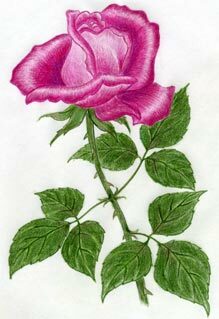 This will add to the rose stem a natural look. 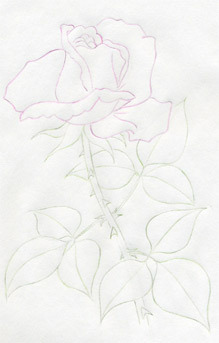 The thorns should be colored with combination of green, red and brown. On the eaves, please leave area around the vein lines brighter. Color the leaves by dark green color pencil. 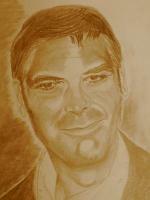 Brighter areas around the vein lines give the drawing a three-dimensional impression. 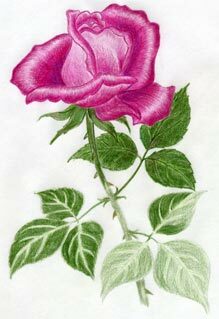 As you see, learning how to draw a rose is not only making the perfect rose head but quite a many details on the green parts too. When you’re done with leaves, now, take a dark red color pencil and slightly, really very gently add a weak red color shade on the leaves. A couple of very interesting manga drawings by Chi that you are going to love.